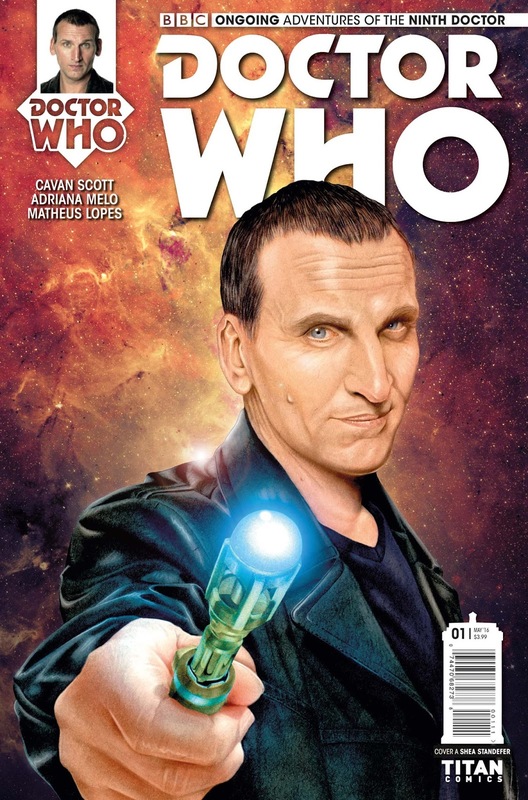 Titan Comics: Doctor Who - THE NINTH DOCTOR #1 Review | Warped Factor - Words in the Key of Geek. No autographs unless you’ve paid, says Tony. Have you paid? Go wild and crazy, Ninth Doctor fans. The taciturn Time Lord with the ears and the leather is back, joining Doctors Ten, Eleven and Twelve as a regular series at Titan Comics after his short-run smash from Cavan Scott and Blair Shedd. Scott’s back in the writer’s chair here, carrying the story on from that short run and giving a sense of consistency right from the off. Cavan Scott knows his Who, and he’s also got a great appreciation of comic-books as a medium, so it should come as no surprise that he kicks off with the Doctor, Jack and Rose running away from something large and dangerous, bantering as they go. A quick spot of exposition and boom – we’re on with the story. In this case, there’s a version of Jack from that part of his history that was referenced in The Empty Child and The Doctor Dances, and then used with a staggering sparsity ever after: the period of his life of which he has no memory, having had his knowledge of that time erased by the time agents. That little touch of continuity-mining takes us into a story that’s about as ‘meta’ as you can get. Imagine waking up on a planet where Geeky Reader is the best-selling TV show in the world. Where suddenly, for reasons you can’t fathom, hordes of screaming fans love you, want you to sign autographs constantly, know your life story better than you do, and where you appear to be running around the place being the saviour of the world – except it’s not you. It’s nearly you, but not quite. Wrong. But this is where the Doctor and his friends end up – on a world where ‘Doctor Who?’ is prime time viewing for all the family, (along with The Real Housewives of Alpha Centauri, obviously), and where there’s a Ninth Doctor already, swanning about in a joyous nostalgiafest (you won’t miss it when you see it, though possibly, Classic-fans, you may leave a tiny puddle from all the squeeing). There are things that claim to be…if not exactly a classic villain, then at least a familiar one to long-term fans of the show, but their Doctor’s not right – but, and this is the important thing, we only know he’s not right because we take our certainties into the story with us. The Ninth Doctor travels with Jack and Rose, and doesn’t use a classic vehicle, right? And who the heck is Penny, the plucky girl assistant to the stroppy Northerner? (Yes, it’s a fantastic in-joke. Yes, it works like melted butter on the soul, reassuring us that Scott has crafted a story that brings in as much meta-material as he can). In essence, Doctormania is a vision of what would happen if, say, a real alien who was the source material for Doctor Who turned up at Comic-Con, if Comic-Con was the whole world. Yeah. You’re going to want to sit and let your brain boggle at that one for a while. Nevertheless, in terms of setting up a great world for a Ninth Doctor story, it’s audacious territory and only a writer in complete command of their material and with a healthy dose of chutzpah to boot would dare attempt it. Which is why you need a writer like Cavan Scott to pull it off and do it justice. The cliff-hanger reveal at the end of the issue is pure Ninth Doctor all the way, welcoming one of his most distinctive enemies to the comic-book world. While in story terms, some readers will actually get the opposite of a cliff-hanger from this ending, a kind of ‘Oh. Oh, it’s them’ sense of deflation that will demand great things of the villains going forward into issues #2 and #3, there’s no denying that the artwork delivers them in a way that’s visually very exciting. Let’s talk artwork, since it’s so crucial to delivering the cliff-hanger. Scott and Blair Shedd had some good mojo going on in the short-run, Shedd capturing both the familiarity of the principals and the oddness of the situations they encountered - space centaurs and robotic Kinder eggs in a miniature Time War all of their own. So when the Ninth Doctor came back for a permanent series, it seemed like a given that the duo responsible for his success would both be back in the saddle. There’s an initial trepidation at finding that’s not the case, but within her first handful of panels, Who-newcomer Adriana Melo announces her presence, and the message she carries is very simple – ‘Don’t worry – I’ve got this.’ There’s a sense of surrealist joy about Melo’s early panels here, where she’s freer to interpret than she becomes in later sections of the issue. She gives the ultra-fans we encounter a smiling but predatory look that, more than Scott’s situations themselves, tell the story and might make some real-life fans consider their actions; there’s something about their mouths and teeth that acts as a metaphor for the venality of some fans, wanting, wanting, always wanting, that ever-so-slightly parasitical edge that comes with a long-terms love for a really enjoyable TV show, that sense of entitlement that comes with loving something quite that much. It’s subtly done, but it’s suitably unnerving. Her choice of ‘shots’ is well-balanced, mixing portraits with action sequences, and delivering a Ninth Doctor who, if not always photo-perfect, is always unmistakeably himself, and a great vessel for Scott’s ear for this voice. Rose is rendered more in publicity-shot vixen mode than actual on-screen Billie Piper style, but that only adds to the meta-show feeling and helps undermine your certainties about who’s who and what’s really going on. There are some of what felt like Shedd’s trademark silhouette panels here, but fewer of them, Melo showing a greater tendency to highlight the action which the scenes give her the chance to deliver, pushing the pace of the story with a fluidity that works to get readers invested in the story and sweep them along with its oddness and questions, as well as its Third or Tenth Doctor action sequences. And her delivery of the final-page cliff-hanger actually does an unusual thing – it makes you revel in a visual shock first and foremost, meaning it’s only after you’ve absorbed that visual impact that the storytelling consequences of what you’ve seen fully sink in. You won’t be disappointed when they do – it’s cloister bell time and no mistake. There are props to spare too for Who-newbie Matheus Lopes on colourist duties – those action sequences have a vividness that drips colour, and occasional monochrome panels punch above their weight, especially when Matheus juxtaposes cold and hot colours to change moods in a heartbeat or even to change the speed of a sequence. Essentially, the message is clear – if you’re worried about a change of artistic personnel on the Ninth Doctor comic-book range (we’re not sure who’d be worried about such a thing, but on the remote chance that it’s you), don’t be. Cavan Scott’s back in the driving seat with a story that takes the Ninth Doctor and his friends into weird new territory, and there’s much much more to learn about what’s going on yet, while the launch team of Melo and Matheus prove they’ve got a good handle on both the Ninth Doctor’s era and the necessity of comic-books to deliver spectacle, colour, pace and imaginative scope that adds to the writer’s vision. Doctormania, Part 1 is a weird but unforgettable issue with lessons for real science fiction fandom, delivered though the comic-book medium. It’s geeks, looking at geeks, and rendering them in all their geekitude, through probably the geekiest of art forms. It really doesn’t come more meta than that unless, say, Benedict Cumberbatch, dressed as Doctor Strange while filming the Doctor Strange movie, stops off at a comic-book store to buy Doctor Strange comics. The point is, Scott delivers a story that’s both massively entertaining, and uses science fiction to look at science fiction fandom, then sells it to science fiction fans. Including you – go peer at your comic-book supplier of choice today, in case they’re not really who they say they are. 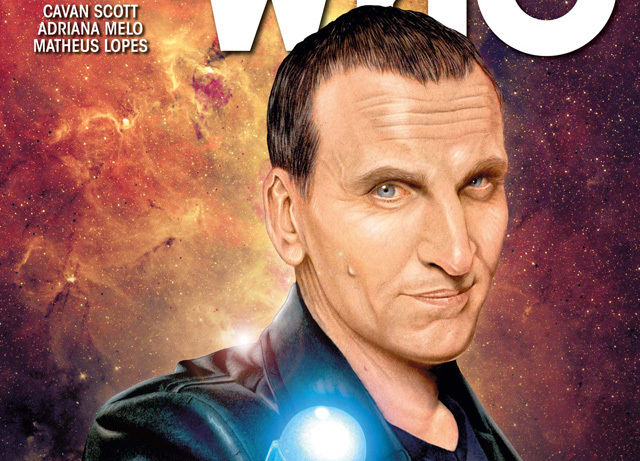 Then pick up Doctormania, Part 1 and revel in the return of the Ninth Doctor.